Its my 150th day today, woohoo, 150 different balloons and still going. To celebrate I have made a giraffe, this design is from a balloon modeller in Hong Kong, I only know him by the name Indiespapa, thanks for this design. 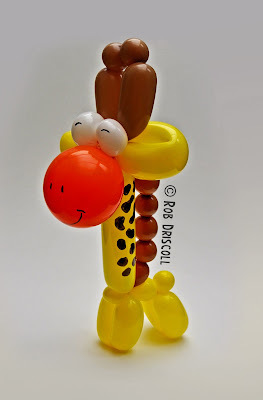 The Giraffe is made from 4 balloons, there is a yellow 260, a white 260, a brown 260 and an orange round for the nose. On another note, I did an interview for a lovely lady called Patricia Balloona recently, it is for her very cool balloon blog, you can see her blog and my interview here - http://patriciaballoona.wordpress.com/, I was very honoured to be included in her blog so thanks for that Patricia.